Roselli Sting (g. by Casino Prince). 7 wins to 1400m, A$233,990, to 2018-19, SAJC Autumn Series Final H., Pinot Palooza H., MAC Stop Drug Driving H., Mac Drink Driving Grow Up H.-twice, 2d SAJC Junction H., Schweppes P., AAMI Spring Carnival H., Mac Drink Driving Grow Up H., 3d SAJC William Hill 2YO H., Junction H., Happy 60th Birthday Cathy H., Filly and Fox Fundraiser H., MAC Drink Driving Grow Up H., Adelaide Galvanising H.
Something More (f. by Onemorenomore). 3 wins-1 at 2-at 1300m, 1400m, A$86,800, SAJC Schweppes 2YO H., Steadfast Brecknock Insurance H., 2d SAJC Ubet H., Holdfast Insurance H., Greg Venn's Significant Birthday H., 3d SAJC Action Line Marking H., Gawler & Barossa JC Barossa Volkswagen H.
PHELAN READY (More Than Ready). Champion 2YO in Australia in 2009. 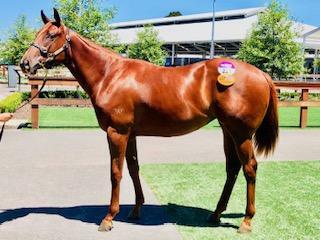 4 wins-2 at 2-at 1200m, 1400m, A$3,772,350, STC Golden Slipper S., Gr.1, GCTC Magic Millions 2YO Classic, RL, BRC XXXX Gold H., Desleigh Forster Racing H., 2d MVRC Manikato S., Gr.1, STC Todman S., Gr.2, BRC QTC Cup, Gr.2, George Moore S., Gr.3, GCTC Magic Millions Cup, RL, BRC Keith Noud H., L, 3d STC Premiere S., Gr.2, BRC Lough Neagh S., L, MRC Testa Rossa S., L, QTC JF Meynink S., L, GCTC Prime Minister's Cup, L, Goldmarket H., L, SCTC Glasshouse H., L, 4th VRC Newmarket H., Gr.1, Bobbie Lewis H., Gr.3, Gold Coast Guineas, Gr.3, BRC Lough Neagh S., L, BTC Tommy Smith Slipper, L.
Limbo Star. 4 wins from 1200m to 1600m to 2017-18, 3d BRC Mount Franklin H.
Another Slipper. 3 wins at 1000m, 1200m, A$94,115, to 2018-19, BRC LUCRF Super Supports Jockeys H., SCTC Sky 2 H., 2d BRC Super Butcher H., GCTC Kiyomi H., 3d Ipswich TC City of Ipswich H.
BAUGHURST (Tayasu Tsuyoshi). 10 wins from 1200m to 2200m, A$703,615, MRC Coongy H., Gr.3-twice, Werribee Cup, L, VRC The Sofitel H., MVRC Gillies Famous Pies Country Cup, MRC Ungar H., 2d MVRC Moonee Valley Gold Cup, Gr.2, MRC St George S., Gr.2, VRC Bart Cummings H., L, Divinyls H., Hilton Nicholas H., MVRC Christopher Stear H., 3d MRC Sandown Classic, Gr.2, VRC Queen Elizabeth S., Gr.3, MRC Naturalism S., L, 4th BRC Eagle Farm Cup, Gr.2. NANCY ELEANOR (Blevic). 3 wins. See above. STILLME (Blevic). 7 wins-1 at 2-from 1050m to 1600m, A$299,238, SAJC New Year's Gift, L, CS Hayes Memorial Cup, L, VRC Mrs Mac's Beef Pie H., MVRC Rosier Commercial Furniture H., SAJC Iga Distribution 2YO H., Distinctive Lifestyle H., Marina Pier Holdfast Shores H., 2d MRC TS Carlyon Cup, Gr.3, SAJC John D Lee S., L, MRC Premier Signs P., 3d MRC Nadeem H., SAJC Allan Scott Park Morphettville Flying H., 4th SAJC RA Lee S., Gr.3. Duchovny. 8 wins from 1250m to 2050m, A$158,180, SAJC Bonnett's Saddleworld H., Alice Springs Cup, SAJC Redbrook Carpets H., Chatswood Stud H., 2d SAJC Silverline Security H., Honda CR-V H., Malaysia Airlines H., T&R Pastoral James Blundell P., 3d SAJC Yalumba H., 4th SAJC Birthday Cup, Gr.3. Major Deal. 4 wins from 1400m to 1800m, A$118,400, WATC Jackson's Restaurant H., Swan's Pride Welter H., Parkinson & Mann H., Sun City Boy H., 2d WATC Wynns Coonawarra Estate Welter H., Prince of Pop Welter H., Malayan Racing Trophy Welter H., 3d WATC Living Comfort Welter H., EDP Hayes H., 4th WATC Australia Day S., L.